Two simple concepts for a better understanding of your Biomagnetic Separation process. The apparently simple nature of the biomagnetic separation process is the reason for its great popularity in Life Science, but it is also one the causes behind problems with its proper application. All users are aware of the working principle: the magnetic field applied generates a force over the magnetic beads or particles. It is very simple to perform a quick feasibility test: just take a small quantity of magnetic carriers in suspension, approach a magnet and – Voilà! – the beads/particles will speed towards the magnet. Success with initial experiments often leads the users to overlook the biomagnetic separation process itself. The need to focus on the biological and chemical aspects of the project (selecting the right bead, ligand and surface binding) delays deeper discussions about key factors governing the biomagnetic separation process. It is not unusual for users to be unaware of the physics governing the interaction between the magnetic beads and the applied magnetic field. This lack of understanding of the critical parameters of the process usually leads to inconsistent results as the project advances. Although the details of the biomagnetic separation process involve a lot of Physics, for most users, two simple concepts are enough to give a clear picture and avoid problems. A constant magnetic field DOES NOT generate a magnetic force over a magnetic field, but only a torque. To generate a magnetic force we need a magnetic field changing the magnitude and/or direction in the space. A magnet block does not generate a magnetic force because it generates a high magnetic field, but because it creates a strong magnetic field gradient. Magnetic beads and particles are highly susceptible. That means that the magnetic moment changes significantly when a small magnetic field is applied, the magnetic response being linear. 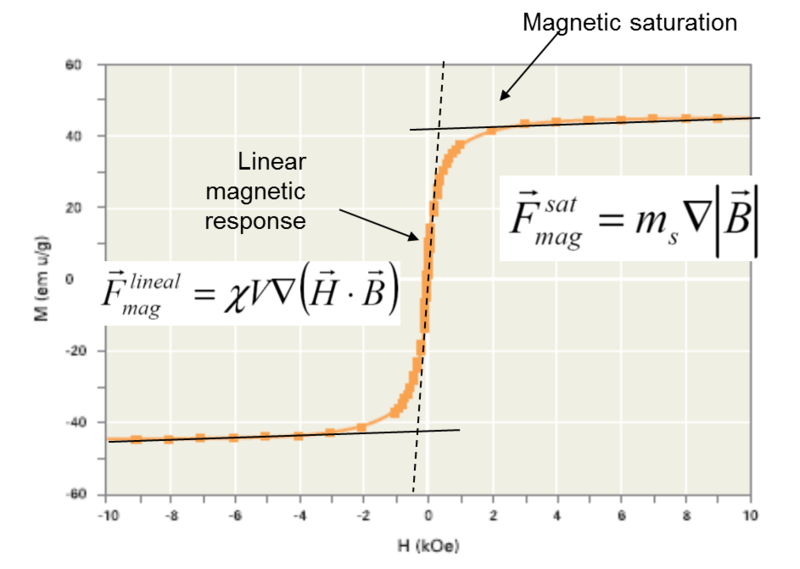 However, when the field increases beyond a certain value, the magnetic bead becomes saturated and the increase in magnetic moment is almost zero for additional increases in the magnetic field. The expression for the force is different in both cases. These two concepts illustrate why classical separators do not define a single magnetic force value. As both the spatial magnetic field variation and the field itself change with the distance, the force is different at every point of the space. Far from the retention area, the beads are in the linear magnetic response region (low field) and the force is proportional to the gradient of B2. If the magnet is strong enough, the beads are saturated in the retention area. Depending on the geometry, the gradient can be very high. The Advanced Biomagnetic Separation systems manufactured by SEPMAG generate a magnetic field pattern with both a high magnetic field and gradient. This means that all the beads experience the same magnetic force and the separation process is performed under precisely defined and homogenous conditions. Working under these conditions means that the force is greater farther away from the retention area (the homogenous force is much higher than in classical separators), which reduces both separation time and losses. At the same time, the force in the retention area can be gentler that in non-homogeneous devices (the homogenous force is usually calculated to retain the beads when the supernatant is removed, but not higher), reducing the risk of irreversible aggregation and, in cell sorting, increasing the viability of the captured cells. Under homogenous biomagnetic separation conditions, monitoring the process makes it possible to compare different conditions. The effects of magnetic beads characteristics, concentration or buffer viscosity are clearly identifiable. Given that the magnetic force is constant throughout the sample volume, changes in separation dynamics can be directly related to changes in the suspension. Why Monitoring Biomagnetic Separation processes?